TiE50 is TiE Silicon Valley’s premier annual awards program keenly contested by thousands of technology start-ups worldwide. Awards are announced at TiEcon, the world’s largest conference for entrepreneurs. TiE is a global, not-for-profit network of entrepreneurs and professionals dedicated to the advancement of entrepreneurship. TiE provides a platform for mentoring, networking and education for technology entrepreneurs worldwide. Our global network of 54 chapters located in most major North American, Asian and European countries and cities with more than 14,000 members across 13 countries. TiE50 track record since inception in May 2009 shows that 94% of the winners and finalists have been funded, attracting Billions in investments! Many of these companies have been acquired, merged or went public. 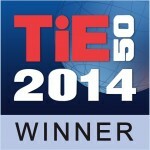 TiE50 awards are announced each year at TiEcon, the world’s largest conference for entrepreneurs. Participating technology start-ups benefit from a vast ecosystem of venture capitalists, angels, and entrepreneurs. Other participant privileges include significant investor exposure, online virtual showcasing and technology and business partnering/networking. Since its inception in 1992 in the Silicon Valley by a group of successful entrepreneurs, and corporate executives, the organization grew to be the World’s largest non-profit dedicated to the virtuous cycle of wealth creation, focused on nurturing the next generation of entrepreneurs. This year, the TiE50 Awards Program is recognizing the top technology start-ups will not be restricted to any specific technology segment. We invite all technology start-ups worldwide, particularly early stage companies to participate. TiEcon and TiE50 offer a unique value proposition for early stage technology start-ups.